The second the bus stopped at the corner, my little girl climbed off and ran as fast as she could toward where I stood. Something wasn’t right. She was crying. Immediately my mind jumped to worst-case scenarios. Not quite so dramatic, someone told her they didn’t like her anymore. In typical grade-school fashion, the mood of the relationship had turned sour on the playground. As a result, my girl fell out of the other girl’s affection. For years I’ve been working with my girl to learn how to ask for what she needs. It’s hard for her, tough girl that she is. Typically she either guts it out or reverts to theatrics. Instead, we’ve discussed how to use words to communicate needs. That day, on the street corner, she did just that. If only I could learn to do the same. Most days I’m glad to be an adult. I mean, really. Who wants to travel back to the days of diapers or pimples? When I’m hurt or discouraged or afraid, however, my adult skin wears thin. When bills demand paying and parenting proves impossible. When marriage is hard, friendships struggle, and doctor’s appointments fill a calendar. Then I wish to travel back in time, when a girl’s greatest fears could be soothed in a mama’s arms. Held close, all was well. To a child, there’s nothing greater than a parent’s ability to comfort. But comfort doesn’t come so easily to us grownups. Where do you and I go when relationships wound and the injustice of life stings? We adults carry such responsibility, don’t we? Such blunt knowledge of the unfairness and volatility of this life. Even if we avoid news and media, fear and pain still have a way of finding us. We can’t escape them. Ourselves, more often than not. We either erect a false front of strength or cave in to a pattern of complaining. But neither brings much relief. The Bible is rich with examples of men who voiced their needs and asked God for His comfort. To the leader Joshua, overwhelmed by his new task: “Do not be afraid; do not be discouraged” (Josh. 1:9). To the Israelites enslaved by ruthless Egyptians: “I am concerned about their suffering” (Ex. 3:7). To the widow who’d lost her only son: “Don’t cry” (Luke7:13). To the adulteress caught in her shameful sin: “Neither do I condemn you” (John 8:11). To the blind man longing to see: “Receive your sight; your faith has healed you” (Luke 18:42). To the disciples, who ached because their friend would be leaving them, Jesus said: “And surely I am with you always, to the very end of the age” (Matt. 28:20). And to those of us who wade through the deep waters of this modern life, longing for a world we’ve heard about but have not yet seen, Jesus promises: “I am going there to prepare a place for you” (John 14:2). Regardless of your pain—whether physical, emotional, or spiritual— you don’t have to pretend to be strong, nor do you need to succumb to your tears. Become a child in the presence of a comforting Father. Don’t be afraid to expose your need and ask God for comfort. Then, count on Him to deliver. Dear Lord, I come into Your presence with my broken heart. Instead of building walls and lashing out, I give my hurts and fears to You and seek Your comfort. As I read the scriptures, let me hear Your words through the ages, as words meant for me in my struggles. 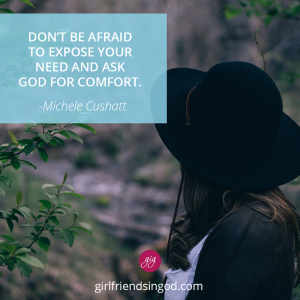 How has your human experience of comfort impacted your expectation (or lack thereof) of comfort from God? Allow the truth of the Bible to rewrite what you believe about God’s offer to comfort you. It’s here! Michele’s new book, I Am: A 60-day Journey To Knowing Who You Are Because of Who He Is, is now available. If you’re tired of doubting your worth and feeling exhausted from all the effort at being “enough,” this daily journey may finally deliver the peace you crave. For short, inspirational devotional messages delivered right to your inbox, check out Michele’s FREE I Am Video Experience. He will give you a Jesus hug any time. I have been so hurt and broken, this devotional was great today. Perfect timing. Thank You, Father God. And thank you Michele.